"I'm starting to think this might be my favourite track" said Lewis Hamilton yesterday. Really the only question that should arise from this is why it took him so long to come to that conclusion. 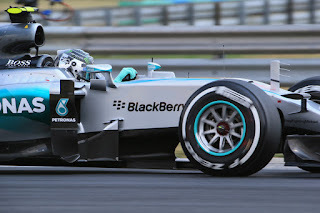 Last time out in Silverstone we heard a lot about Lewis's home round. But even though his record there is a good one in every aspect aside from geography this one in Hungary is his real back yard fixture. For as long as he's taken F1 cars around the Hungaroring he's been like a candidate in a US Presidential election carrying their home state. Here Lewis can make a car dance in a way that no one else can. He did it again today in seizing pole position - his ninth this year and his fifth at this circuit ever. And it was a triumph more decisive probably than any of those previous ones. As ever the precise causes of Lewis's alchemy at this track isn't known, probably not even to Lewis himself. But with its layout necessitating an acrobatic yet precise approach its low grip surface usually requiring a sliding tail to be tamed we can begin to formulate our most probable answer. 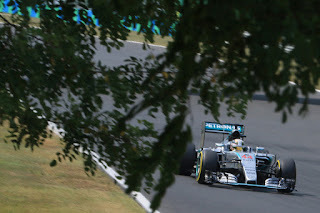 Lewis took up the subject after his latest imperious performance here in Hungary's qualifying. "I think coming here I've always had, generally, good experiences here" he said, "but loving the weather, loving the city. But also… I love the track. It feels a bit like an old go-karting circuit that we used to race on many years ago when we had super special soft tyres and super grippy, you know, and I think with the temperatures it gives us a lot of grip here". Given that as mentioned the Hungaoring usually is associated with low grip his words give rise to the possibility that he finds grip out there that no one else does. That the track miraculously becomes unslippery when he drives on it. More likely he just makes it seem that way. Heading into the weekend and as we've grown accustomed to the fight for first was expected to be a private Mercedes affair, and so it proved. 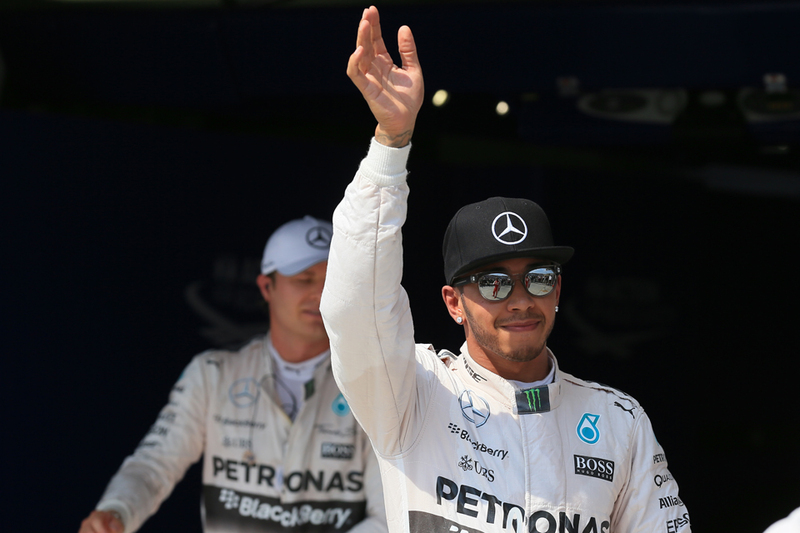 But even of the two Nico Rosberg has rarely looked on Lewis's page this weekend. He can point at some mitigating circumstances, later Merc technical boss Paddy Lowe spoke of Nico's car having a mistake in its configuration yesterday while for much of today's qualifying hour Nico lamented his handling, particularly with apparently intermittent understeer, and Lowe further spoke of Nico having problems with front tyre pressure which may have caused this. But you suspect that even if these had been perfect it would have got him a bit closer to his team mate only rather than ahead. Lowe indeed perhaps let on more than intended when he said that the handling woes explained "some" of the gap. Whatever was the case Nico's efforts were a transparent exercise in futility. It was never better summed up than in Q3. In both runs he was ahead of Lewis on track and first time around on used tyres Nico set a purple time - indicating the best time of all up to that point in the session - in each of the three sectors. But every time Lewis further down the road came around and took the purple sector off him. You could almost imagine him saying "thank you very much" as he did so. He finished the lap 0.358 seconds under Nico's mark. In their final runs Nico's opening sector again glowed purple and with Lewis apparently compromised in traffic on his out lap there momentarily looked a sliver of light for Nico. But it was plunged into darkness almost immediately as Lewis still set a first sector a tenth better than his. It got no better for Nico as by the end of the lap he could only shave the gap to his team mate rather than beat it (Lowe mentioned a lock-up too) and as a coup de grace Lewis swept around to stretch the difference to a gaping 0.575. "I don't have an explanation" said a rather shell-shocked Nico afterwards. "Qualifying went pretty much to plan, everything, but just didn't find the pace and it's been a bit up and down all weekend for some unexplained reasons, so just need to look into it tonight. Definitely not happy with the way it went today." The rest as noted were on a separate page even to Nico's though Sebastian Vettel managed to maintain the standard top three, just pipping Daniel Ricciardo in the Red Bull which on this track with hardly a straight on it looks far more potent. Analyses of Friday running suggested that the RB11 may be even stronger in the race than in qualifying while Ricciardo also saved an extra set of fresh soft tyres by being the only one not to use them in Q1. His team mate Daniil Kvyat may however be disappointed with P7. Between them you'll find Kimi Raikkonen and Valtteri Bottas, the Williams as ever not looking quite so competitive on a track that requires more downforce. The other big story from qualifying was about McLaren, and not for the reasons those at Woking would have wanted. 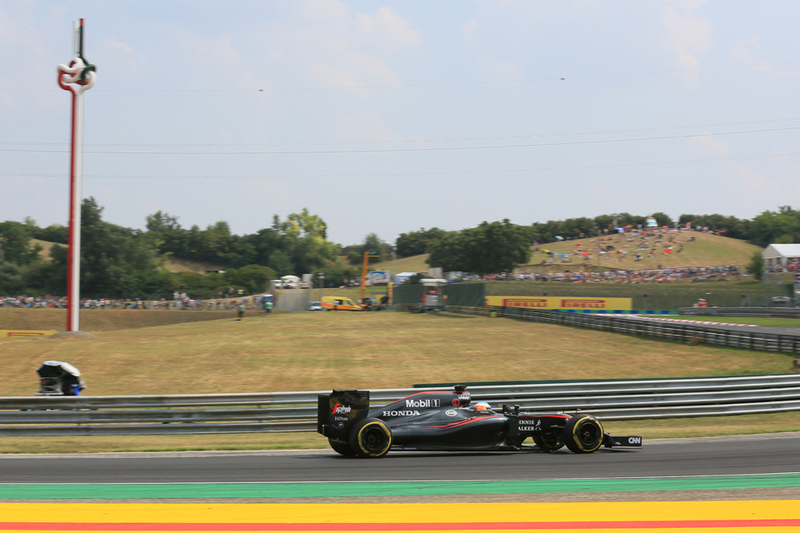 The team had identified this round as one that it had a better chance than usual of a good result and free practice suggested this might be well-founded, with Fernando Alonso finishing up P8 in both FP2 and FP3. Jenson Button too spoke openly of a chance of qualifying in the top ten. But then the chill wind of reality struck. 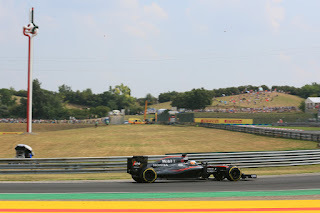 Button sank out of qualifying in the first part and will start sixteenth and while Alonso scraped through he didn't go much further as his car stopped in the pit entrance not long into Q2. "It was something electrical, some connector, the power went off and that was a shame" said the Spaniard. He made it back to the pits with a push but wasn't allowed to return to action due to the rule about cars having to get to the pits under their own steam (and it transpired his technical problem couldn't be fixed either). Both drivers spoke of technical problems in Q1, Button of not getting his electrical deployment on the main straight on his final lap. But it didn't seem the first time that McLaren had been found wanting when everyone else turns the volume up for qualifying. Back at the front tomorrow's race looks about as futile for Nico and the rest behind Lewis as qualifying was. And while he of course was keen not to be seen to be counting chickens after qualifying the Englishman still couldn't stop a certain confidence radiating from his words: "The work's not always done on a Saturday, I've got lots of work to do tomorrow but in terms of how the weekend has gone I'm incredibly happy with that. I think it's so far been one of the best… I can't remember having the performance I've had this weekend on any weekend, so I'm really happy with that. There's a long way down into Turn One and the race is incredibly tough physically but also technically for the car, but I feel confident in my team and my car and hopefully we can convert it tomorrow." There is one crumb of comfort for his rivals that even with this track being associated with follow my leader only one person in the last ten years has won a Grand Prix here from pole position. Or perhaps it isn't a crumb of comfort. As that man, who has done it three times indeed, is Lewis Hamilton.